We envision a generation of global public health students equipped with the diplomatic skills to pursue Health for All. Our mission is to develop experiences that advance the understanding of the World Health Assembly in order to empower future leaders in global health policy. Below underlies what AMWHO, Inc. strive to achieve as an organization. We cultivate passionate leaders in global health. We bring students together to foster their interests in global health policy in all of its forms. We provide a platform for individuals to build lifelong connections — creating a network of support, knowledge, and resources – to help them become effective leaders in their communities. We believe in learning through doing. We encourage students to engage with learning at the intersection of health, policy, and diplomacy beyond textbooks, lectures, and research. Thus, we organize WHO simulations, health summit discussions, and leadership opportunities for students to learn through doing. We empower and celebrate diverse representation. We enrich our organization by bringing together people from different places, identities, and lived experiences. By inviting, uplifting, and empowering voices traditionally not present at the policymaking table, we contribute to establishing an interconnected community of emerging leaders that is more representative of those impacted by health challenges today. We promote and practice the principle of thinking globally and acting locally. We encourage students to recognize the global impact of collective local action, and to work towards implementing global health policies within their communities. AMWHO is a fantastic, diverse experience for students at any level! I got the chance to mentor and be mentored, all while honing my speaking skills and learning more about a pressing and global public health issue! AMWHO opened my eyes to seeing the overlap between foreign policy and global health. The experience, the speakers, and the delegates all contributed to a collaborative atmosphere. The students are passionate about changing the world positively here, though we all hailed from different majors, colleges, and backgrounds. AMWHO was the best weekend for me this year and I can't wait for the next year! AMWHO was an immersive experience in which I gained valuable connections and observed relevant debate that worked to move towards real solutions. It was truly a beneficial event that helped me gain a lot of new knowledge and be around people who were enthusiastic about what they were doing. AMWHO challenged me to take the information and ideas that I use in a lab and think about them actively in the light of real policy change. It was a great paradigm shift and an exciting way to truly understand the phrase "translational medicine." The unique experience of AMWHO allowed me to develop professional skills that are applicable to my career. This conference has been crucial in helping me determine my career path and give me connections and insights I didn't think possible. 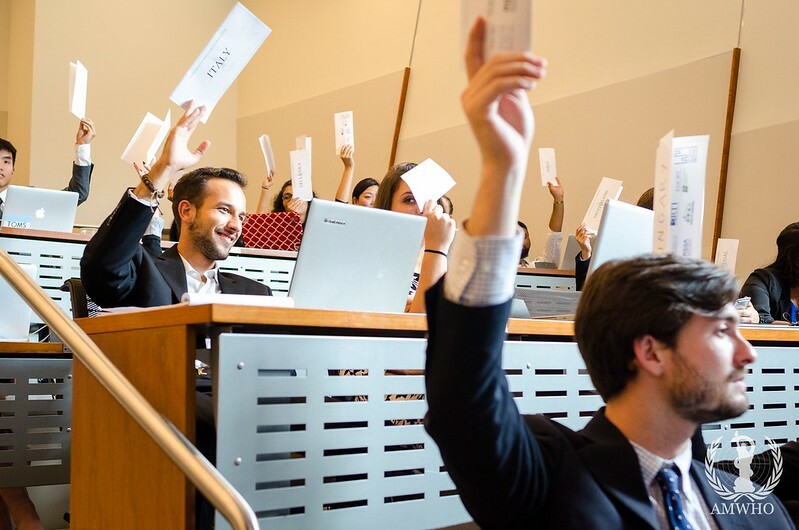 Short of being appointed as a global health diplomat, this is the next best possible educational way to learn about the international health policy process - by personally being part of the simulated effort to craft it with representatives of other countries. Participating in the AMWHO international conference really solidified my interest in pursuing a career in global health policy. It is an unparalleled experience and more students should have the opportunity to participate. Nothing motivates me more than meeting others who share my passions. AMWHO did this for me and will be remembered as a special part of my academic journey.